The Oster TSSTTVSKBT 6-Slice Large Capacity Toaster Oven with Brushed Stainless Steel is a convenient product packed with features. Its convection cooking technology sets it apart from other products in the market as it is able to cook evenly and thoroughly. This product has affordable price and has better performance than those at the same price range. With its large capacity, multiple cooking settings, stainless steel body and pleasant aesthetics, it could be a must-have product for most large kitchen countertops or replacing a regular oven. Timer with shutoff and bell – This product comes with a 60 minute timer, ideal for cooking large portions like chicken and casserole. It also has a bell which alerts the user when the set time is up. The oven is automatically shut off at the end of this set time, which is loved by many users. The timer and bell controls can be set using a manual control knob. 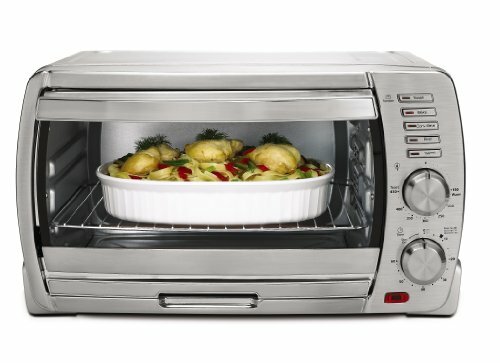 Convection Cooking – This oven comes with a convection cooking setting, which can be turned on or off depending on usage. Convection cooking helps to cook evenly, and produces results faster and more efficiently. Digital buttons – You can select settings and functions by the touch of a button. Buttons are aesthetically placed on the right hand panel of the oven, and contain LED lights to show when they are on. Also, there are two manual control knobs on the same right hand panel. One is for setting the temperature and one is for the timer. Stainless steel body – The stainless steel construction helps protect the body against rust and looks appealing and polished. Extra Convenience – This oven has two rack positions. You can save time and energy by attaching two racks at one time in this large capacity oven, so that two items can be cooked at one time. It also has a removable tray for faster cleaning and keeping the insides of the oven clean. This makes this product easy to maintain. What Do Owners Say About The Oster TSSTTVSKBT? Interior Material – For those who worry about the issue that non-stick material could produce chemical smell, the oven interior is made by stainless steel other than non-stick coating, and it is easy to clean with a pull-out crumb tray, although it might cost you a little more time. Large Capacity – This oven’s large capacity is ideal for larger food; it can replace the role of a regular oven because of its ability to cook a whole ten pound chicken. Convection Technology – The convection function helps to cook faster, saving on electricity bills. Generating Less Heat Outside – It also generates less heat so that cooking does not heat up the whole kitchen, and is a good choice for consumers living in areas where the temperature could soar in the summers. Safety Issue of Glass Door – Some buyers experienced that glass door exploded when oven was preheating to 400 degrees. This could be a big safety issue of Oster TSSTTVSKBT. Costing Space – If space is an element that you consider, take it in mind that this isn’t your typical 6-slice oven. For small kitchens with less counter space, this oven can look overwhelming. Labelling Quality – Owners also found that the paint for the buttons had worn off after a period of use. Other problems that you might encounter are that the steel parts of the oven are naturally prone to getting hot while the oven is in operation, and the fan makes a small amount of noise. Customers who are looking for an oven which can be used for most everyday baking needs, is modestly priced, and which saves money on electric bills by cooking faster, should go for this product. This may include individuals living in medium sized apartments who do not own a regular oven. WHO SHOULD NOT BUY THIS PRODUCT? The size of this oven might be an issue for some kitchen owners with modest counter space. For such customers, this product is not fully recommended, unless they can put up with the space that this oven is going to take up. This oven by Oster is packed with functionalities, and is a quality product that can cater to most domestic baking needs, while saving on money and time on account of its convection cooking technology. It also looks great, and is large enough for most food.